Possessing radiant curb appeal, this design's stone and siding facade stylishly blends with triple gable peaks, columns and decorative windows to showcase a truly unique exterior. A grand staircase immediately greets guests in the formal foyer, while an adjacent art niche adds flair. The open dining and great rooms permit a natural traffic flow and embrace the homes open layout. The breakfast room overlooks a rear porch. 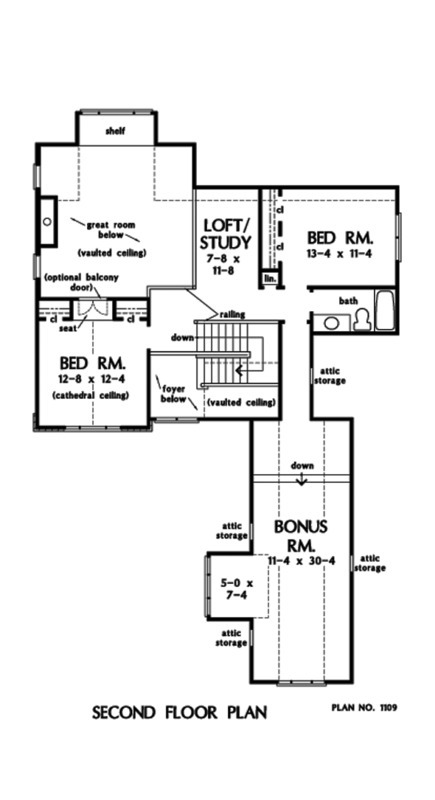 Completing the first level is a spacious master suite and study/bedroom with nearby full bath. Featuring a private privy, dual vanities, separate shower and tub, the master bath's details fuse functionality with modern living. 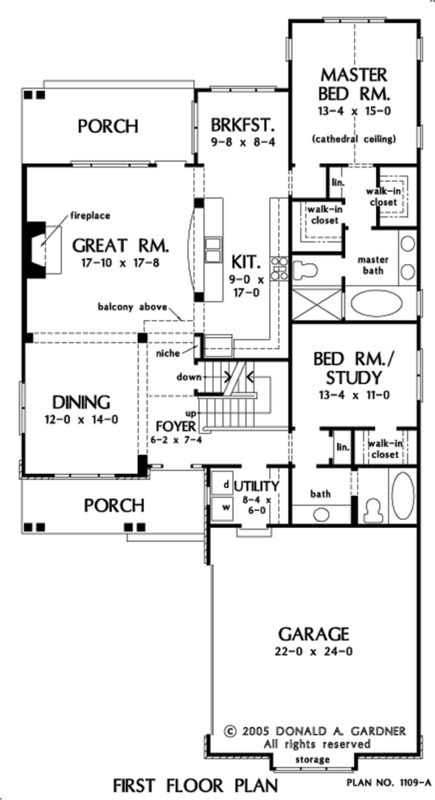 The upstairs consists of a loft, generous bonus room and secondary bedrooms with a built-in balcony seat. 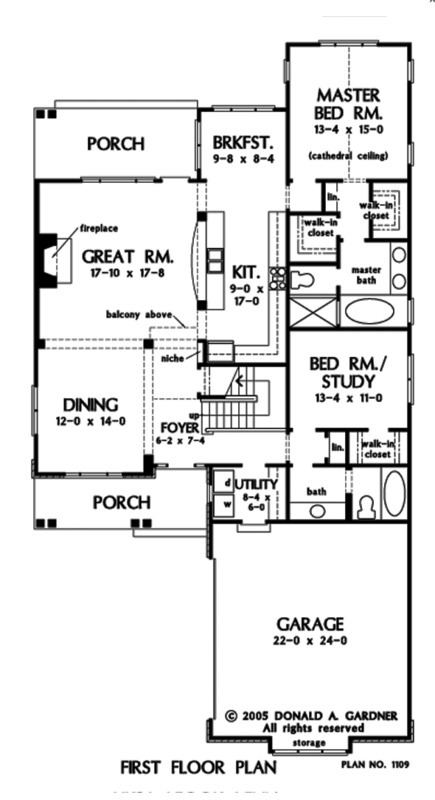 Bonus Room: 456 Sq. Ft.
House Dimensions: 42' 4" x 79' 10"
Great Room: 17' 10" x 17' 8"
Great Room (Vaulted): 17' 10" x 17' 8" x 18' 0"
Master Bedroom (Cathedral): 13' 4" x 15' 0" x 12' 6"
Bedroom / Study : 13' 4" x 11' 0" x 9' 0"
Bedroom #3 (Cathedral): 12' 8" x 12' 4" x 11' 4"
Bedroom #4 : 13' 4" x 11' 4" x 8' 0"
Kitchen : 9' 0" x 17' 0" x 9' 0"
Garage Storage : 8' 8" x 1' 6" x 0' 0"
Foyer (Vaulted): 6' 2" x 7' 4" x 18' 0"
Bonus Room : 11' 4" x 30' 4" x 8' 11"
Porch - Front : 19' 8" x 6' 0" x 9' 6"
Porch - Rear : 18' 4" x 8' 0" x 9' 4"
Loft / Study : 7' 8" x 11' 8" x 8' 0"